Product prices and availability are accurate as of 2019-04-23 15:28:55 UTC and are subject to change. Any price and availability information displayed on http://www.amazon.com/ at the time of purchase will apply to the purchase of this product. When scratches appear on hardwood flooring the result is immediate anxiety. Nobody wants to see their flooring scratched, but to be honest all floors get scratches in them. Today pre-finished floors are mostly finished with Aluminum Oxide based finishes. When that type of finish in particular gets a scratch it shows a white line. Wearmax has perfected the formula to eliminate the white! Scratch is an easy to apply method for anyone to eliminate the white marks left behind by scratches, scuffs or abrasions to hardwood flooring. Scratch is dried under direct interior lighting and creates a permanent seal that will not wash off when the floor is cleaned. The technology in Scratch is unprecedented and patent pending. 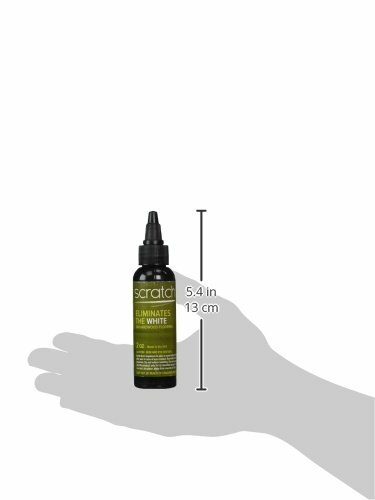 • It is vital to read the instructions closely since this product is essentially a flooring finish in a bottle. • Never apply in bright sunlight or in exterior applications. The finish will cure almost instantly. • In settings with very low light you can speed cure time by adding a lamp or other additional lighting to accelerate the cure speed of the repair. 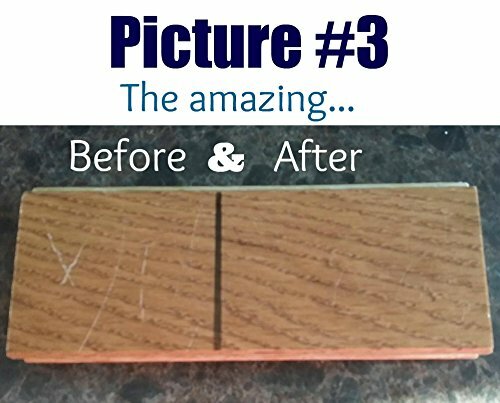 • If you have a dark color or stained floor and the scratch or gouge is all the way into the wood; you may want to use a color marker or touch up kit before applying scratch. Scratch is proudly made in the America by WEARMAX. A world leader in hardwood flooring finishes. WearMax® Scratch Concealer reduces the appearance of scratches on hardwood floors. Almost all pre-finished hardwood floors scratch WHITE when the topcoat is pierced. The visible white line is a result of crystallization of the flooring finish. WearMax® Scratch Concealer is a repair treatment that reseals the topcoat layer on pre-finished hardwood floors. Once applied, the product will cure to become a PERMANENT part of the flooring finish. Scratch Concealer will not wash away like all the alternative repair solutions do. WearMax® Scratch Concealer will not remove the physical indentation of scratch, or fill in dents, gouges, or voids. It will greatly reduce the visibility of most abrasions by eliminating the unsightly white line and resealing the surface of the damaged finish. 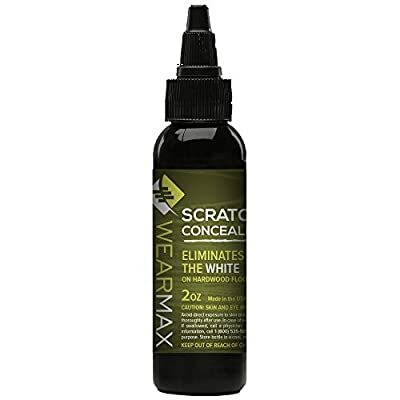 WearMax® Scratch Concealer is cured under regular interior lighting. Reduce total dry time through increased amounts of light. Use only as directed. To maximize the performance of this product, please follow the instructions on bottle. Scratch Concealer was created for pre-finished hardwood floors with polyurethane and or aluminum oxide topcoats.